Over the last decade, emerging technologies have ushered in the need for governments to approach accelerated change and challenge in new ways. The impact of increased urbanization and shifting citizen expectations, combined with the ways technology is reshaping cities, is creating a call to governments and city leaders to evolve their role and shift their mindset around how to effectively govern into the future — not a simple task. The demands of the new mindset are twofold: a curiosity to identify the opportunities and challenges that a technology-enabled future holds, and a creative approach that seeks the right mix of tools and partnerships so governments are empowered with technology to meet new demands. Whether an elected official, city manager, mayor, or a community visionary, there are four areas of digital transformation occurring within governments, which are ripe with opportunity for innovation and cross-sector collaboration. Preparing for these shifts enables governments to chart their own path for success and avoid the future’s push to react impulsively to disruptive trends. From short-term housing rentals such as Airbnb, to ride-sharing platforms like Uber, and scooter rentals such as Scoot, the new economy of shared services is creating entirely new regulatory demands for city governments. 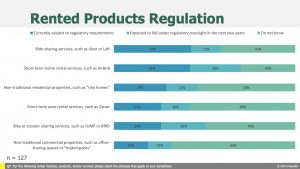 Accela recently conducted a study on emerging areas of regulation where more than 125 state and local government professionals were surveyed about the impact of new and emerging regulations. Looking specifically at the regulation of rented products, less than 50 percent of many new services are regulated, for example short-term housing, which is currently only 42 percent regulated. Interestingly, the study showed that the need for increased stakeholder communication was a top change critical to meet these new regulatory demands. There is also a timeliness to addressing these new areas of regulation, both for the safety of city residents, and also for governments to capture therevenue opportunities of permitting, licensing and more. A huge modernization is underway in how citizens wish to interact with their governments that mirrors the speed of our fast-paced world. Today, citizens crave the ability to engage with government services similar to how they interact with private sector services and mobile-based applications. They want access to instant answers and information at their fingertips, and without standing in lines. Consider the difference between the customer experience of ordering dinner with the UberEats mobile app, compared to standing in line at the DMV to renew a driver’s license. hat if government services could eventually offer this same type of seamless and instant exchange? In the future, a large part of what will enable frictionless communication between the public sector and citizens will be establishing clear digital channels for information transfer. Establishing these types of channels is critical for citizens to ensure they are receiving timely information on policies and regulatory changes. In Accela’s recent research study, 43 percent of respondents said community awareness of policy regulations was a leading unmet need of emerging regulatory areas. Though the public sector has been slower to digitally adapt than the private sector, this is by no means an indicator that the opportunity is lost. Instead, it is a chance for governments to observe what has worked in the private sector and use these as indicators for how to digitally transform themselves. New cloud-based systems are enabling governments to make data-driven decisions, which is paving the way for safer and more intentionally designed cities. This is an area with huge opportunity for data transparency that will ultimately empower citizens, governments, and private businesses to coexist more harmoniously from the get go. In the state of California, for example, consider the importance of intentionally mapping and regulating the location of cannabis dispensaries within cities and neighborhoods. New technology offerings are now making it possible for governments to better regulate cannabis dispensaries by managing how they are zoned and where they are opened, based on existing data on other potentially conflicting locations such as schools and places of worship. This type of technology is bringing a new level of visibility and transparency so that governments and city officials can make highly informed decisions that ultimately protect their citizens and communities. The process of governments adapting and migrating to cloud-based services is ongoing, with many state and local governments still navigating this massive shift. For governments, the shift to cloud-based systems has brought huge benefits, including rigorous end-to-end data encryption and a scale of data collection, analytics, and systems agility that was previously impossible. On the other hand, ransomware attacks on government systems in 2018 are a reminder why collaborative discussions between governments and technology providers about potential risks are essential. This type of cross-sector dialogue is critical as we walk further into a connected future. These four areas driving digital transformation — emerging regulations, citizen expectations, citizen safety and data security — are evolving how cities, citizens, governments and the private sector are interacting, which is why now more than ever is the opportunity for leaders and governments to recognize not only the changes ahead, but more importantly, the role we play in governing the future of society towards the best-possible outcome.